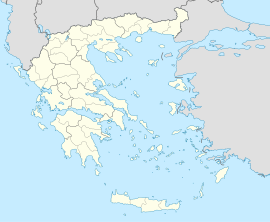 Larissa (Greek: Λάρισα [ˈlarisa]) is the caipital an lairgest ceety o the Thessaly region o Greece an caipital o the Larissa regional unit. ↑ 2.0 2.1 2.2 2.3 "Twinnings" (PDF). Central Union of Municipalities & Communities of Greece. Retrieved 2013-08-25. ↑ "Rybnik Official Website — Twin Towns". City of Rybnik. Urząd Miasta Rybnika, ul. Bolesława Chrobrego 2, 44–200 Rybnik. Retrieved 2008-11-01.